The Battle Resort is a location that you gain access to after the completion of the Delta Episode. 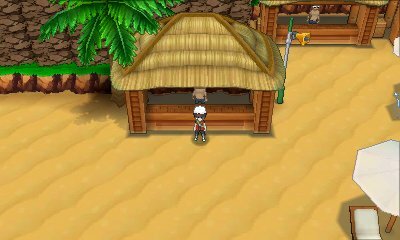 Using the SS Ticket, you board the SS Tidal and travel across to this island in the southern part of the region where the strongest trainers come to be. You even see Team Aqua, Team Magma and Wally on this island. 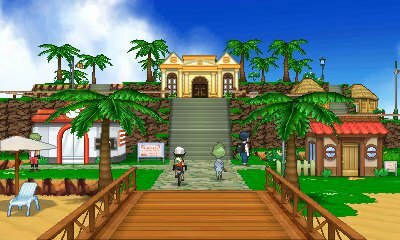 This is a popular resort island and is the ancestral predecessor to the Battle Frontier, which is said to be under construction. All along the island, there are numerous strong trainers to battle each day, each with slightly different teams to the day before. In addition to that, there are a lot of characters speak to, some of whom give items and even Pokémon. Finally, there's even a second day care center on this island, allowing you to breed more Pokémon here, and to top it off, you can easily ride around the island with very little button changing, in order to hatch eggs with ease. Making its return from Pokémon X & Y, the Battle Maison exists at the absolute top of the island. 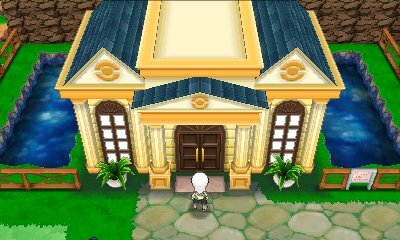 According to the various characters in the Battle Resort, the Battle Maison originally started in Hoenn before the leaders made a copy of it in the Kalos region. There are four different styles of battle here: Single, Double, Triple and Rotation, and each one has got its own leader. The rules are the standard flat rules of Pokémon battling, locking out specific legends and preventing two of the same Pokémon and item. However, there are a few differences. Instead of going through rounds of seven trainers, you will just continue to battle until you want to take a break, or you lose. This allows for you to go at your own pace and you don't forfeit anything by taking a break. In addition to that, you will receive at least 1 BP for every battle you win, straight after the battle. Finally, you have the ability to change the battle music between four different tracks provided.